Add in grated zucchini, grated carrots and some coconut and you have yourself some pretty fine healthy snacking or breakfast muffins. In a large bowl, mix together eggs, brown sugar and oil. Add zucchini, carrot, banana and coconut flakes. Mix until well combined. Add flour, baking powder, baking soda, cinnamon and nutmeg. Mix until ingredients are just blended. Evenly divide batter into 12 lightly greased muffin cups. Bake in preheated oven for 20 to 25 minutes or until muffins are golden brown. Remove from oven and cool in pan for 5 muffins. Carefully remove the muffins from the pan and let them cool on a rack for 15 minutes. 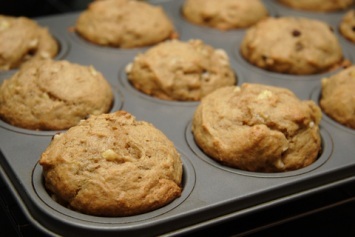 Want to add even more nutrition to these delightful healthy muffins? Add 1/2 cup chopped walnuts to the batter when you add in the banana etc. And the best part? They are absolutely fabulous tasting, so fabulous that those picky non-vegetable eaters in the house won’t even know they are eating their vegetables. I love this easy muffin recipe too because it doesn’t have too much sugar. 1/2 cup of brown sugar for an entire batch of muffins isn’t too bad. Plus, if you really want to cut out the sugar and for a diabetic muffin recipe, try the Splenda and brown sugar blend for baking. Or even better – use Stevia (just remember to use less as it is much sweeter than sugar. Follow the suggestions on the package for amounts). Want muffins even healthier than that? Use coconut sugar, which has a very low glycemic index and can be used cup for cup just like sugar. You can also replace the white flour with whole wheat flour. Just remember to sift the flour first as whole wheat flour is a bit denser than white flour. It packs a lot more nutrients though, so the switch is worth it in my opinion. I think you will really love these wonderful healthy muffins. And they are a great way to hide vegetables for kids and veggie haters. Our apricot and banana muffins can be found here.